Gloobus Preview is an quick file previewer which supports images, documents (pdf, odf, ods, etc. ), source files, audio (mp3, wav, ogg and more), video (avi, ogg, mkv, flv, etc. ), folders, archives, fonts, plain text files and more. Gloobus Preview was recently fixed so it now works with Ubuntu 12.04 too. Besides the Ubuntu 12.04 fix, the latest Gloobus Preview from BZR comes with GTK3 support, support for password-protected documents, a rewritten documents plugin, WebM support, fixed ttf, pdf and video plugins and other fixes. To use Gloobus Preview, you must install gloobus-sushi, a package that replaces GNOME Sushi (if installed). GNOME Sushi is an application similar to Gloobus Preview that was introduced with GNOME 3, which unfortunately doesn't integrate too well with Ubuntu. The PPA also has packages for older Ubuntu versions, but you'll need to use Nautilus Elementary so the keyboard shortcut works (also, for Ubuntu older than 11.10, don't install "gloobus-sushi"). 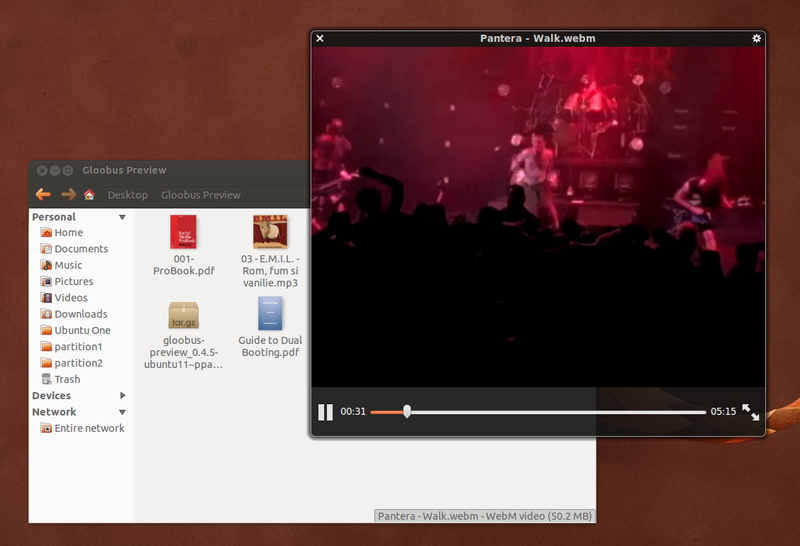 Once installed, open Nautilus, select some file and press the SPACE key to quickly preview files using Gloobus Preview. Then launch Dconf-Editor, navigate to apps > marlin > preferences and set "/usr/bin/gloobus-preview" for the previewer-path. Then, just like in Nautilus, use the SPACE key to quickly preview files. For other Linux distributions, Gloobus Preview can be downloaded via Launchpad (BZR).